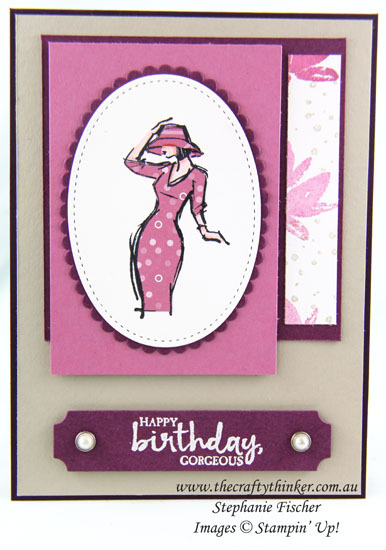 The gorgeously elegant lady is from the Beautiful You stamp set in the Occasions 2017 catalogue. I stamped her twice: once onto Whisper White cardstock and one onto the patterned side of a leftover piece of Sweet Sugarplum Envelope Paper from the In-Colour 2016-2018 pack. I then cut around the dress and hat on the patterned piece and glued them onto the black and white image. I used Watercolour Pencils and an Aqua Painter to add colour to her skin. The main image is cut out with an oval Stitched Shapes framelit and layered with Rich Razzleberry cut with a Layering Oval framelit. The greeting is heat embossed in white onto a piece of Rich Razzleberry and then cut with a die from the Project Life Cards & Labels set. I added a couple of Metal Rimmed Pearls to finish it off. Click here to find out more about Sale-A-Bration and making the most of the free items available (one per purchase of $90) or contact me for more information.